This was a second project for these clients, involving the refurbishment of the ground floor and first floor of a four-storey house, installing an extension and re-roofing. The design was a collaborative effort between LNZ Refurbishments and the creative owners to find ways in which to realise their vision. We removed several internal walls and installed two large rectangular structural steel frames and associated steel beams. This created a large open-plan living space with full width glass folding doors leading out to the garden. A zinc roof was fitted, with a cantilevered canopy overhanging a new curved hardwood deck below. We then lowered the floor at the rear extension to create a snug area on the same level as the garden. New oiled oak floors were fitted, along with a curved fascia and steps. 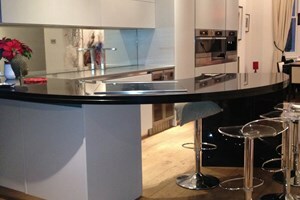 A new handleless kitchen was installed, with a curved gloss-black granite worktop. 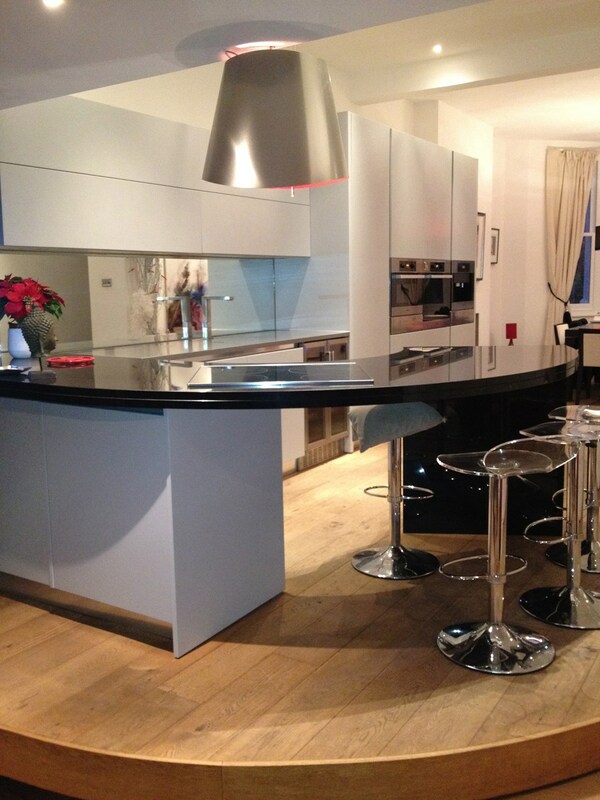 New bespoke stairs were installed, leading to a refurbished utility room, bedroom and lounge. New plumbing, heating and electrical systems were installed throughout. Garden renovations included curved garden walls, a new boundary wall with horizontal cedar battens on top, feature mirrors and coloured lighting.